I am going to start this by saying that I am by no means an avid race fan. I don’t stay up until 3am to watch the big race, and I have never dreamed about sitting in an F1 Racer. That being said, I didn’t hate Grid 2 and in fact found it quite enjoyable for what it is; a good racing game for racing fans. There are a few issues with the game that stop it from taking the leap forward to being one of those truly great racing sims. I was pleasantly surprised with the campaign for Grid 2. I jumped in expecting nothing more than a loose threat to tie together a few races, but what I got was far from that. You start your racing career as an amateur, doing street races for cash before you are scouted by a rich petrol-head who is looking to start up his own racing league, the WSR. His dream is to create a league filled with the best drivers from all over the world and from all racing disciplines to determine who truly is the best in the world. You are selected to help start the WSR and it is your job to traverse the world, taking part in race meets for the various clubs in order to entice their best drivers and their loyal fans over to the WSR. Each of the club you participate in has a different, specialty style of racing for you to try out and dominate. As you improve as a driver and gain a following as a global racing celebrity, you also help the WSR gain prestige and prominence within the racing community. Over the game’s 30+ hour campaign, you are shown your rise to fame, as people search YouTube for your races, text one another and discuss on message boards the future of the WSR. This gives the player a feel of being a racing superstar from their very own home. The story narrative is also tied together by segments of ESPN’s SportsCenter. The clips were filmed in the SportsCenter studio with anchor Kevin Connors and international Motor Sports analyst Toby Moody. The segments are nicely made and add a sense of realism to the whole package that is Grid 2. Several times, I had forgotten that the WSR was a fictional league. 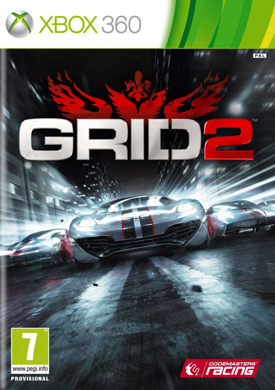 Grid 2 is a racing simulator first and foremost. It isn’t an arcade-style racer like Need for Speed or outlandish like Twisted Metal or Carmageddon. Due to this, Grid 2 will only really appeal to a very small section of the market. However, Codemasters know that the game’s niche is those people who stay up until 3am to watch the Grand Prix, and the die hard driving sim fanatics who are always looking for something new. 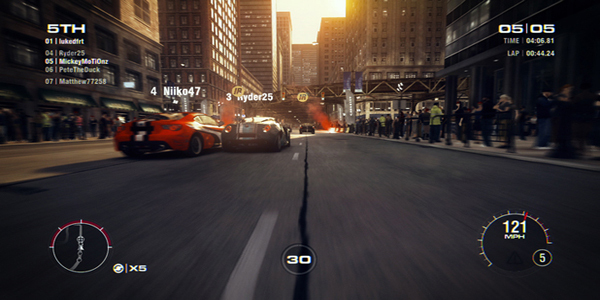 With that in mind, Grid 2 offers up a lot for those people, with enough depth and variety to keep them coming back. The game has no less than seven distinct race modes, ranging from your typical 12 car race, through to drifting events, time-trials and the timeless video game classic; checkpoint racing. These different race modes are littered throughout the game’s 30+ hour campaign and because of this you usually aren’t doing an event often enough to become bored of it. The only exception to that I found is the standard race race. The standard race was a part of the events for every club regardless of their specialty, and in comparison to the other events they just felt dry and almost like a chore. 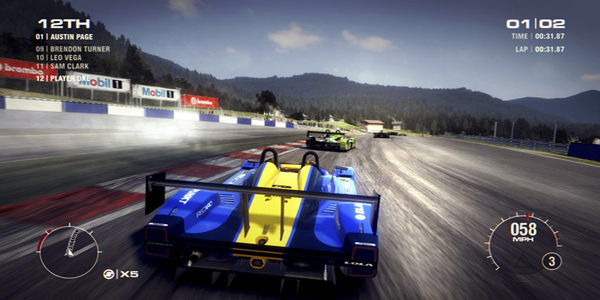 The game is filled with a large number of race tracks from all around the globe. Racing enthusists will be happy because any of these are officially licensed tracks that the Codemasters team have painstakingly recreated down to the smallest detail. It is a great touch and one that will have anyone who has ever dreamed about getting behind the wheel of a million dollar racing machine excited. Yet surprisingly, as you progress through the campaign, you find yourself racing through the same tracks over and over again. It helps when it comes to memorising the twists, turns and when you should be spinning into a drift, but at the same time it can quickly grow tiresome seeing the same backdrop and racing the same tracks over and over again. One of the methods Grid 2 tries to alleviate the feeling of repetition the use of LiveRoutes. LiveRoutes are dynamically changing courses that make for unpredictable racing. The track can change in pivotal points and have you going down roads and paths that you have never seen before. For the most part it is a great feature, especially as it removes the mini-map from the game’s HUD forcing you to think on the fly and rely only on your instincts and what you can see instead of track-memory. The sad part is that no matter of dynamically changing tracks can distract me from the fact that I am still driving around the same streets over and over again. During Single-Player, for those instances where you take a turn too sharply and end up against a wall, or spin out of control and careen over a cliff, there is a feature that I like to call the “Oops Button” (actually I call it something much worse but I wont print it here). What the Oops Button does is it lets you rewind time so that you can attempt to take a corner again or move out of the way of a car that is going to rear-end you. With limited uses in each race, the feature becomes helpful without breaking the game’s balance. That isn’t to say that the feature isn’t without its issues. Sometimes as you go rewind time it may be difficult to determine where in turn you made the mistake that caused you to go nose first into a guard rail, and as such returning to the game too early can result in a serious case of deja-vu – costing you one of your limited uses and having gotten you no where. The multiplayer of Grid 2 almost feels like a completely separate game that just shares the same space as the single player. None of your skills or unlockable vehicles transfer between the campaign and multiplayer. This definitely has its ups and downs a key plus being that it creates fairness and equality among players, where you don’t have any distinct advantage over someone just because you beat the campaign and they didn’t. On the flip side is that some of the unlockables come in the form of livery options, and having to reach level 5 just to use green paint is a little more than frustrating, especially if you are like me and spent the majority of the single-player game with the same design. Aside from a few hiccups like that, Grid 2’s multiplayer is well-defined and unique from other racers, largely due to RaceNet. RaceNet is an online service that is free to join and provides you with a plethora of features that are otherwise unavailable. These features include weekly challenges that you can compete asynchronously against your friends or strangers on the leaderboards. In addition, RaceNet keeps careful tabs on your driving skill, style (if you are a clean driver or a bully on the road) and a whole set of other stats to ensure that when you are in matchmade games, you are racing against players similar to yourself. The only problem I really had with RaceNet’s style of match-ups was that it considered me a racer who likes to “Trade paint” and play rough, when in reality I really did try to race clean… I am just a terrible, terrible driver and should not be allowed behind the wheel of a Dodge Charger. Grid 2 is for the most part quite a pleasant game to look at, with car models that match their real-world counterparts down to the smallest details. It is impressive the amount of work that Codemasters have put into these models, and as you look at them in your garage and out on the track, you can unmistakably recognise makes and models. I have to take a moment here to discuss the camera angles. There was a lot of buzz leading up to this game’s release about the removal of the racing-game standard interior camera view. 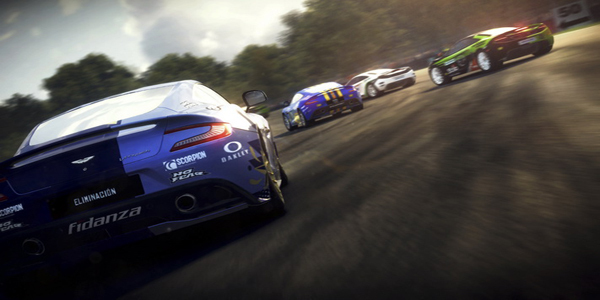 Codemasters in their production of this game chose to remove some elements in order to increase the graphical fidelity of the game, and they opted to remove the interior camera because less than 5% of players across their other racing titles used it. I for one don’t think that this detracts from the game at all. 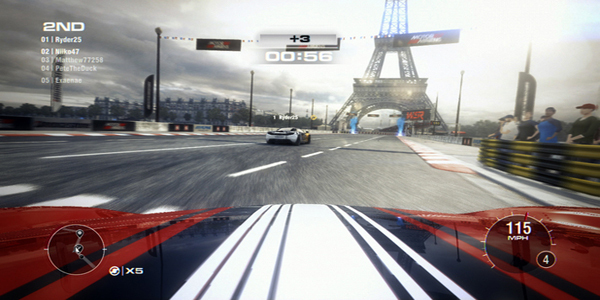 The game’s three camera angles; bonnet view, bumper view, and third-person are all great and provide players with enough choice to tailor to their play styles. The bonnet view was my go-to camera angle as it offers a nice wide viewing angle and you can still see far enough down the track that you are never surprised by an upcoming turn, always seeing it well ahead of time and preparing accordingly. The detail on cars during the race was quite nice, with metallic and glossy paints reflecting the scenery around them. Unfortunately, ss your car takes damage (which mine always took plenty of) you may lose the hood of your car and be treated to a view of its engine. While this isn’t necessarily a bad thing, the engines themselves were blocky, pixelated and had low-resolution textures, that not only did they feel like an afterthought, but they can severely detract from the immersion of the game. You are able to customise your car’s design and livery to an insane amount. The game offers over 50 patterns, 5 different types of paint, a bunch of colours and over 40 wheels to choose from, so the list of what you can create is nearly endless. Codemasters boasts that the number of possible combinations exceeds 6 billion. After you have meticulously created the perfect design for your racing beauty, you can pick and choose your sponsors (or lack thereof) and where you want their logos on your car. The sponsor logos are much like the engines in that they are often pixelated, of a low-resolution and just blurry when out on the track. This becomes especially noticeable when using bonnet view as the logos will often take up a large portion of the bottom of your screen. The tracks themselves are meticulously designed and many are recreated from real-life areas. The detail and beauty of some of these backdrops is absolutely stunning. Driving through Paris at night with fireworks in the sky and the Eiffel Tower in the distance is a sight to behold and one that can quickly have you driving into a wall because you weren’t paying attention to the road. While the background stuff is immaculate, there are some issues with the foreground, with some guard-rails, audience members, trees and cliff faces having a lower resolution and could quite easily be distracting, however you are usually zipping past them so quickly you wont often notice. If Grid 2 has any areas true areas of weakness it is its audio. As it tried to be as close to the real thing as it can while still remaining accessible, the audio isn’t flashy or engaging as many other racers. Instead of ambient music tracks, the most you will usually hear is the rev of your engine or the sound of tires skidding along the road. While some of these sounds are near-perfect, others really feel bland and uninspired. As you would imagine, one of the game’s primary sounds is of your car engine humming away as your hurtled down the streets at over 200km/h. I was disappointed in the sound as to me it didn’t sound like the powerful engines I was expecting out of these cars. I even had to pause my game several times while playing because I wasn’t sure if the sounds were coming from the car, or from my neighbour’s electric table-saw. It turned out about 50% of the time to be the table-saw. When I’m in a Mustang, I want to hear the engine roar with power and authority, not to have it sound like a simple power-tool. Through the races, you will have the disembodied voice of your race-coach in your head reminding you about which position you are in, telling you to ease off the aggression (I heard that one a lot), and making sure to remind you that you hit a wall (just in case you didn’t see part of your car fly off). Having a race-coach in your ear is a great addition and really adds to the feel of the game, but he can quickly grow repetitive and is occasionally slow to react. Often times I was being told that I could overtake someone to get to third place when I had already made it to second. The last thing I want to touch on regarding the game’s audio is the music. Music really only appears in menus is sparsely ever heard during an actual race. For people who want to be completely immersed in the feel of being a multimillionaire racing superstar it may work well but for me the lack of music just made me hate the sound of my engine all the more. 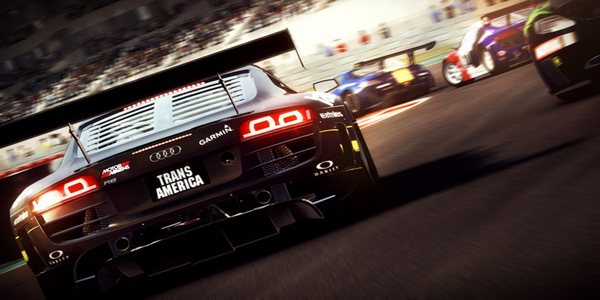 Grid 2 is a game that has a lot to offer for fans of sports racing, and of driving simulators. While there is nothing there for people who aren’t fans of the genre, the incredible amount of content from its thirty hour campaign to its wide variety of racing styles and its RaceNet focused multiplayer, it offers plenty for the avid driving fanatic. If you have ever dreamed about getting behind the wheel of a Touring Car and hurtling down Miami at near 300km/h this is definitely a game for you. A few nagging visual and audio problems are what really hold this game back and keep it in the realm of a good racer instead of a great one.